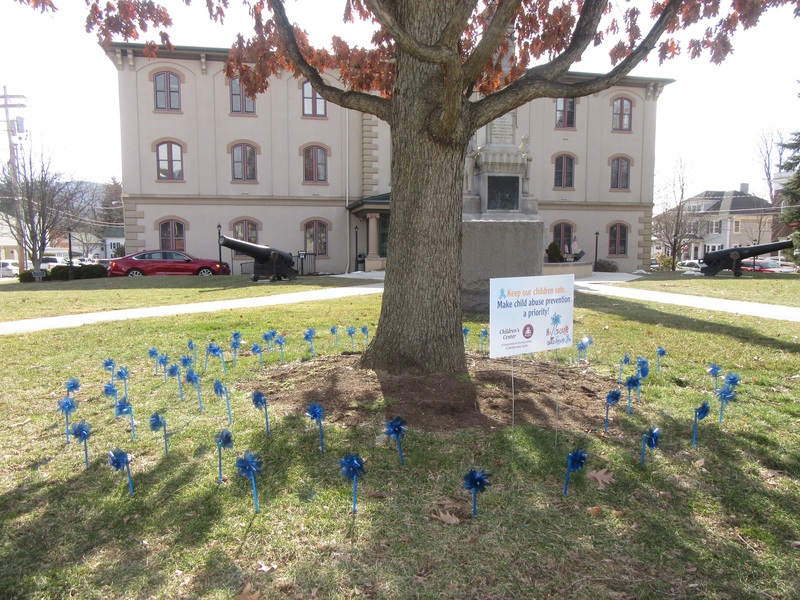 Fifty-eight pinwheels were planted in the yard of the Wyoming County Courthouse on March 29, representing the same number of children in Susquehanna and Wyoming counties who have been reported as victims of abuse or neglect so far this year. Wyoming County Commissioners (seated, from left) Judy Mead, Tom Henry and Ron Williams proclaimed April as Child Abuse Prevention Awareness Month with the help of (standing, from left) Children’s Center of Susquehanna and Wyoming Counties associates Kimberly Tuttle, Andrea Venesky, Janine Fortney and Amber Loomis, and Wyoming County District Attorney Jeff Mitchell. 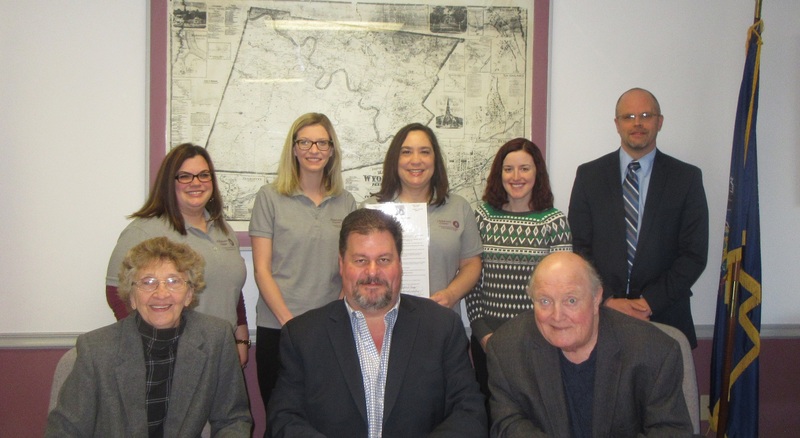 One of the highlights at a meeting of the Wyoming County Commissioners at which the participants alternately shared their hopes and frustration on a number of topics was the proclamation of April as Child Abuse Prevention and Awareness Month. Three representatives from the Children’s Center of Susquehanna and Wyoming Counties were present on March 22 for the reading of the proclamation, as was District Attorney Jeff Mitchell and Amber Loomis from the Family Services Association. The latest annual statistics from 2015 indicated that 513 referrals of child abuse and neglect were reported in Susquehanna and Wyoming counties, and Children’s Center director Janine Fortney noted that there have been 58 cases reported by the two counties already this year. 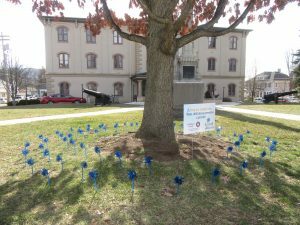 After the reading of the proclamation, 58 pinwheels were planted in the courthouse lawn to attract attention to the problem. The commissioners expressed their dismay at the numbers but thanked the representatives for their commitment to improving the situation. Commissioners Judy Mead and Tom Henry had just returned from the annual spring conference of the County Commissioners Association of Pennsylvania (CCAP), which was held in Harrisburg. Both were upbeat about the topics discussed, the ideas they brought home, and a perception by others in the state that Wyoming County is at the forefront of a number of issues. On the matter of fair royalty payments for gas lease holders, Mead related that PA attorney general Josh Shapiro currently has the case in his hands, but there has been no movement on it yet. The Pike County Commissioners, Mead noted, are leading the charge to increase awareness and find funding for education and treatment on tick-borne diseases. Commissioner Tom Henry was impressed with progress among corrections departments at identifying potential inmates with mental illness more quickly and keeping them out of the prison system. “For far too long, the wrong people have been going to jail,” Henry said. Commissioner Ron Williams, who was unable to attend the conference, agreed and suggested that the problem was exacerbated by the closing of the state’s mental hospitals about 25 years ago. “Our correctional institutions became mental hospitals,” he stated. While they were in Harrisburg, Gov. Tom Wolf announced a new broadband initiative aimed at getting high speed internet services into remote and under-served areas of the state. 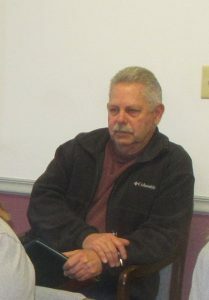 The governor appointed former Bradford County Commissioner Mark Smith to lead the charge, and Mead expressed hope that Smith’s familiarity with service deficiencies in the Endless Mountains will be a benefit to region. The opioid epidemic continues to be a hot topic at all levels of government, and Henry reported that he and Wyoming County EMA director Gene Dziak had been invited to speak at the Governor’s Opioid Task Force meeting planned in Wilkes-Barre on March 28. “We’re running way ahead of the governor’s directive,” Dziak concurred. He attended a PEMA conference recently where local EMA’s were encouraged to get involved with measures to curb the crisis. “We’re already doing these things,” said Dziak. Nonetheless, Henry and Dziak agreed, the struggle continues to be daunting. Dziak estimated that 10 doses of Narcan, the controversial antidote for overdose victims, had been administered in the county in the last month alone. The strength of an application has been reduced from four to two miligrams per dose over the past two years, he explained, because a two mg application allows first responders a more controlled recovery. The four mg doses often resulted in violent behavior from the person being rescued. Williams expressed his frustration that overdose victims are routinely refusing followup treatment, noting that some people have been rescued with Narcan as many as three or four times already. “If they refuse treatment, they should be put in jail,” he stated. Solicitor Paul Litwin countered that current law prohibits the filing of charges against overdose victims under the belief that they will not seek help if they fear legal reprisal. County planner Lynnelle Welch (above) reported that she’d received only five applications this year for Marcellus Legacy Fund grants, though she expects that others are interested and might apply for some of the remaining $25,000 if a second round is announced. Welch asked the commissioners to approve four recipients of the $5,000 grants unconditionally. They include Exeter Township, where the money will be put toward the estimated $15,000 cost of new mowing equipment for the expanded George Hock Memorial Park at Falls; Lake Winola Fire Company, where funds will go toward the purchase of an air boat and radio system to assist the PA Fish & Boat Commission with river rescues; the Wyoming County Cultural Center, where the grant will be applied to the Explore Wyoming County’s Parks & Trails project; and Factoryville Borough, where the funds will add to planned enhancements in Clinton Township Community Park. 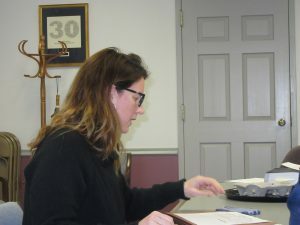 Welch also asked for a conditional approval of a $5,000 grant request from Meshoppen, where the borough would like to purchase and install playground equipment this year. “They aren’t ready to put in a playground,” Welch told the commissioners, adding, “They have some issues that they need to work through with DCNR,” in reference to an agreement the borough made with DCNR two years ago to have a Master Site Development Plan completed for the park with a $15,000 DCNR match. “It’s only going to help them in the long run,” Henry said of Meshoppen sticking to the Master Site Development Plan. He and the other two commissioners subsequently approved the $5,000 grant on the condition that the borough fulfill its agreement with DCNR. 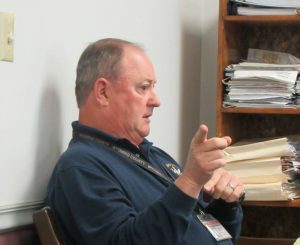 Every round of flood-related buyouts is different, Dziak (above) has explained. “Each comes with its own twists and turns,” and they are challenging to process. Many of the commissioners meetings in 2017 were dominated by a contentious CBDG buyout of homes in Meshoppen borough that is finally coming to fruition. Litwin asked Dziak if he would attend the April 2 Meshoppen Borough Council meeting as an agent of the county as it pertains to the conveyance of the land to the borough. “We need an agreement with the borough that they will use the property in accordance of the guidelines,” Litwin explained, noting there are specifications as to how the property must be maintained. Dziak was also named the designated agent for a possible PEMA buyout of up to five homes in the county that have suffered severe repetitive loss due to flooding. “It’s not an approved project yet, but it’s good news,” Dziak related. “We’ve already qualified the houses that can be in the package. It’s a matter now of having our paperwork together.” Dziak intended to deliver the necessary documents to PEMA offices in Wilkes-Barre on Wednesday afternoon. Jeff Zimmerman (above), who offered several months ago to fill an empty seat on the board of the Wyoming County Housing & Redevelopment Authority, asked the commissioners again if they had received any response from new director Danielle Powell to Zimmerman’s request for an interview. Henry said that he had sent Powell another email on the topic but had not heard back from her. “There are some very good people on that board,” Henry maintained. Williams agreed, but continued, “I’m not a happy camper about how things are run over there” and reconfirmed his interest in getting Zimmerman on the board. During the first official meeting of the Wyoming County Prison Board held since January, Warden Ken Repsher reported that the renovation of shower facilities at the jail in Tunkhannock was nearing completion. Leaks have been addressed and new measures to mitigate mold have been employed. Heating efficiency has been recently approved with the injection of spray foam insulation under a roof along the side of the building.